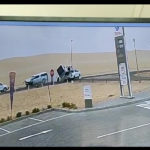 AFTER yet another motor vehicle accident earlier on Thursday at the notorious turn-off to Long Beach between Swakopmund and Walvis Bay, motorists are again reminded of the danger that lurks on Namibia’s roads. Closed Circuit Television footage of a tourist vehicle turning into the way of oncoming traffic, shows the danger of inconsiderate driving. A vehicle driving from Walvis Bay can be seen slamming into the side of the tourist vehicle that turned in front of it and then into a second tourist vehicle that was following close behind the first. Although both vehicles involved in the initial crash sustained serious damage no serious injuries to the occupants of either car were reported. The third vehicle was not seriously damaged.